Nintendo continued its current strategy of skipping the press and speaking directly to fans by publishing a video today detailing its plans for the upcoming E3 2013. "Hi Nintendo fans. 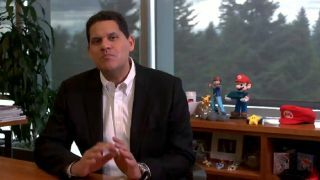 Reggie here," Nintendo of America President Reggie Fils-Aime said to open the video, which Nintendo published on Facebook. "As you've probably heard, Nintendo is going to be doing things a bit differently this year." That's for sure. The company announced in April that it won't hold a press conference as it usually does at E3, instead opting for smaller press events and initiatives that will convey whatever news it has directly to consumers. Fans are hoping that Nintendo will show off an impressive arsenal of new Wii U games at E3. The console is struggling from a lack of first-party titles and the Xbox One and PlayStation 4 are close to stealing whatever thunder it has left. "People are wondering how we can possibly share information about all our games without all the bells and whistles of a press conference," Fils-Aime said. "The Regginator" explained that Nintendo's Facebook, Twitter and YouTube pages will be host to all of the company's E3 news so viewers at home don't miss out. On June 11, Nintendo will broadcast all its announcements, interviews and additional content through these channels. "We'll still be at E3 revealing new information about upcoming games, and those of you at home will still be receiving the same stream of content and updates from the show that you always have," he said. "But it will be different and it will be better." He also reminded fans that some of the games Nintendo plans to show off at E3 will be playable at special demo stations in Best Buy stores across the country. "I'll be watching the comments to see what you think," Fils-Aime concluded ominously. "As always, thanks for being the best fans in the world, and thanks for watching." Curious about Nintendo's decision? Here's why TechRadar thinks it may have made the wrong call.